As people search for smart, creative ways to solve problems in their professional and personal lives, materials that were once thought to only be useful in one way are now being applied to a much wider range of tasks that they were never originally considered for. Versatility, usability and availability are some of the biggest factors people are taking into consideration when they want to find a new way to accomplish their goals. One material that meets all those requirements, and as a result has received increased use in a number of ways over the years, is polystyrene. With its primary uses as packaging and insulating materials, expanded polystyrene (EPS) has proven its value as a lightweight, high-performance material. Its non-absorbent rigid form stands up for years of use in difficult conditions without losing any of its performance ability. Because of these durable performance qualities, polystyrene is being applied to a greater range of applications, which now include home furnishing and construction, prototypes and even advertising. With their manual and computer-controlled cutting machinery and more than two decades of experience with EPS, The Foam Factory can help you use polystyrene for almost any project you dream up. As an insulating product, polystyrene has been used for years to effectively keep homes and buildings at comfortable temperatures as well as to keep out drafts, insects and moisture. Even in its original use as insulation, EPS has grown to take on more duties. One of the most popular uses for polystyrene today is as an insulating cover for hot tubs, a product The Foam Factory specializes in manufacturing. Utilizing their computer-controlled hot wire cutter, The Foam Factory can produce custom covers in any of their three EPS foam densities, in virtually any size, design or shape. This technology and versatility allows the creation of one-of-a-kind covers for spas that may be difficult to outfit with mass-produced products. Tapering and rounded edges can be cut into these covers too, increasing the runoff of moisture and reducing unnecessary weight and size. Possibly the most inventive and unique new uses for polystyrene and custom EPS cutting is in the décor and construction of homes and buildings. With its consistent structure and sculpting ability, custom shapes and forms can be intricately created with specialized machinery. 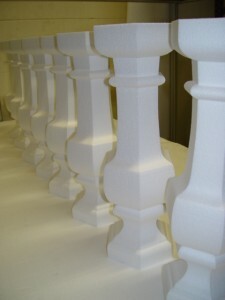 Polystyrene foam is routinely and easily cut into the sheets and planks commonly used in the insulation of structures. But when manipulated by more precise machinery, its rigidity lets delicate but form-retaining structures be created that can ultimately duplicate the appearance of materials multiple times greater in weight and cost. The Foam Factory’s custom hot wire cutter is one of those precision machines that help them create many décor and building accessories affordably, quickly and intricately. With its non-absorbent structure, EPS is water resistant, making it excellent for outdoor décor installations that would otherwise require much more expensive materials, exterior molding being a prime example. Practically any application that is in need of a decorative touch but doesn’t bear structural loads can be made from EPS. Out of polystyrene, The Foam Factory has produced architectural foam columns, foam crown molding, balustrades and railings, caps, bases, and brackets. These can be simple decorative additions to a home or building or encase existing but unattractive support structures. These kinds of additions to a home, when made out of conventional materials like wood or stone can add hundreds of unnecessary pounds of weight to a building and thousands more in material costs to a renovation bill. By using construction foam material, home improvements and customizations can be made for cents on the dollar compared to more expensive materials, while mirroring their attractiveness. The Foam Factory’s cutting machines can create four-sided 3-D shapes and lathe-style twists along the body of a form. 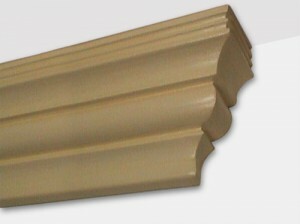 These cuts can create contoured caps and bases for columns of any size, as well as the column itself, to your individual design specifications. Brackets can be created to simulate the appearance of support systems or encase existing systems as well. The Foam Factory specializes in manufacturing indoor crown molding from polyurethane foam, but EPS is the perfect material for any outdoor applications. Weather resistant and able to be cut in many sizes and designs, molding can add understated elegance and class to the outside of any home or business. Decorative balustrades can be an attractive addition to non-supportive railings and balconies outside of upper-story windows as well. Applying hard-coat sealants to these products seals the exterior of the already resistant forms and allows them to be painted to mimic the design of pricier materials, such as marble, sandstone or stucco. For business, EPS pieces serve another outdoor use as landmark signage. 2-D signs are easily created with the aforementioned hot wire cutter and The Foam Factory’s computer controlled waterjet cutting machine may also be used, depending on the design being created. Polystyrene makes for attractive and noticeable company signs because EPS’ customization qualities are easily applied to products on such a scale and the material is much more adaptable to outdoor environments. Water cutting shoots an incredibly thin but highly pressurized stream of water through the foam, capable of tracing foam outlines in addition to creating interior cuts the hot wire cutter is not capable of making. The hot wire foam cutter however, leaves much smoother, consistent edges due to the foam melting as the wire passes through, rather than forcing through the material like the waterjet. Having the advantages of both machines on hand gives The Foam Factory the versatility needed to produce top-quality signs. Depending on desired design, cutouts can be laminated to a solid base, or left as standalone shapes and forms to create an eye-catching sign. In addition to these uses, The Foam Factory’s EPS foam cutting machinery is able to produce custom packaging designs, prototypes and even toys like gliders. So, when the time comes for you to weigh your options for project materials, consider EPS foam and the versatility The Foam Factory’s custom cutting services provide. *NOTE: EPS home décor products are designed as decoration only and not as a structural, support or weight-bearing system. This information is provided at your own risk. The Foam Factory is not responsible for injury, death or loss arising out of the use or misuse of our products. Just wondering if you ship internationally? We are located in Auckland, New Zealand and require 191 x Balusters 214mm centre to centre 490 mm high plus top and bottom railing and 9 corner posts to match… This is to form a balcony on the exterior of a new build. Please let me know if you can assist and what the lead time is. The quick answer to your question is yes, we do ship internationally, New Zealand included. I’ve forwarded your inquiry to our Sales Team who can give you more individualized information on your project and hopefully find a solution that works for you! We are looking at replacing a decorative rooftop balustrade. Original balusters are about 3.5×3.5×25, square tops and bottoms, currently a turned middle section, but given the height above ground, we can probably go with a simple square section. Count about 90 pieces. Would this be more than about $28/piece? (Cost to strip existing puieces). Please contact us with further details to see if we can quote your request. We have poly foam round bolsters and polyethylene round bolsters available. Pricing is available on our website and you can order the foam online. I need at rigid roll of foam (much like an exercise foam) cut to a size of 67 inches long, by 8 inches diameter. I am going to use it to fill in a gap between my mattress and headboard. Can you do this? Thickest we carry is 6″ diameter. Link to polyethylene foam cylinders is here. I am interested in having a small quantity of custom PS pieces manufactured, is there an email address I could send drawings or .step files too? You can see our contact us page for our contact information. Thank you.